Only Buy the Necessary: Having one baby helps parents see what was truly necessary. The only big items we saved from our first child were the crib and changing table that we are still using with her. Will we be buying a new crib or bedroom set? Absolutely not! Instead, I have found a used Chicco Keyfit 30, one of those Fisher Price rocker beds, and I plan to buy a used Moby wrap. All the rest of the stuff I end up needing, I expect to borrow or buy inexpensively used and then resell it when I am finished with it. This is definitely easier to do if you have a lot of friends and family members who are generous in lending you items. Things I will not be buying this time around include a baby bath, baby towels and wash cloths, bottle sterilizer, bottle warmer, or diaper pail. Start Stockpiling Now: I have a good 7-8 months before my little munchkin will enter the world. It is the perfect amount of time to start stockpiling on the essentials. With my first, I expected to breastfeed exclusively and only use cloth diapers. While I was able to use cloth diapers for quite some time, unfortunately there were issues in the feeding department, which meant pricey formula purchases. Of course, I will try to feed the second baby mother’s milk exclusively, but I am also going to take advantage of all the coupons from formula companies to have several canisters ready. The best way to stock up on baby essentials? Keep your eye out on sales and buy a little at a time. I try to always keep diaper coupons with me because you never know when you will come across a good diaper clearance. For example, I have seen many packages of brand name diapers deeply discounted at Vons, where I would not usually shop for diapers. Babies Are Only as Expensive as You Make Them: I have read so many articles and complaints about children costing thousands of dollars each year. I definitely remember our budget taking a much-needed breath of fresh air once we were done with formula, but in all honesty, it was not that expensive. I have definitely been blessed to receive many hand me downs, but I also rarely buy anything new. Just buying second-hand saves a bundle. I also did not buy any presents for my daughter’s first and second Christmas or birthday. Trust me, she had plenty to open and did not even know any different. I have tried hard to shower my baby (as I will with the second baby) with love rather than stuff. I will invest time into her life rather than invest in the latest entertainment gadgets or enrichment classes. The bottom line is, yes, children cost money, but they are definitely worth it. However, they only cost as much as you spend. Do they really need the $20 dress, $300 first birthday party, or $200 toddler dance class? I would love to know your thoughts in the comments. 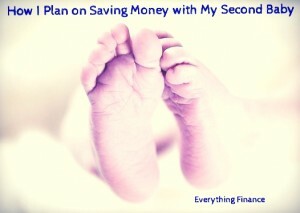 How many children do you have, and how do you save on the costs?